Vivian Barrett, Helen MacHale (Proprietor Newstand), Olwin Goggins, and Mary Lally celebrate the win outside Newstand. 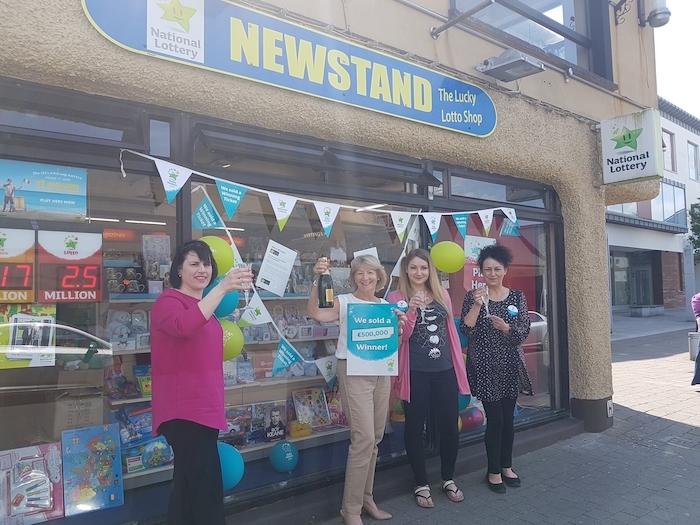 The National Lottery has confirmed that the top prize of €500,000 in the Daily Millions Draw on Friday last, June 1 was sold at Newstand, Market Square, Castlebar. The winners of the prize collected their winnings on Wednesday in National Lottery Headquarters. The winning ticket belonged to a small Mayo family syndicate who have chosen to remain anonymous. Newstand Castlebar is no strangers to big lotto winners, because they have a great track record of winning customers over the years. They are knowing locally as The Lucky Lotto Shop. The town was humming with the great news of another win, and well-wishers are calling to congratulate the shop owners Helen and Michael MacHale on yet another big National Lottery win. Helen, Michael and their staff want to extend their congratulations to the luck winner, and hope they enjoy their windfall, and invest it wisely to secure a great future.